Thorncraft (Blackburn) are the North West's leading and largest motorcycle parts, accessory and clothing suppliers - with over 20,000 square feet of space dedicated to keeping your motorcycle on the move. We service, repair and MOT all makes of motorcycles, quads and scooters. 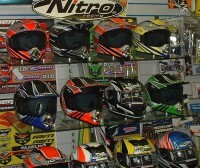 We sell junior motocross bikes alongwith road/off-road quads. Even if you need motorcycle training we can help you with everything from compulsory basic training (CBT) right through to your full licence with direct access training (DAS) (not forgetting your DAS theory test). Whatever your needs we can help you to rocket ahead of the opposition - so don't sit around just thinking about it - call in or contact us - phone, email, mail or fax. We are after a time served, experienced bike mechanic to join with our team. If you've got what it takes, email us your CV. Our new ONLINE SHOP is now in operation, so why not have a browse through the many items we offer, from the comfort of your own home. Fantastic names at fantastic prices - With each item having a colour picture and accurate description, as well as price (inc.VAT), purchasing has never been easier or safer. We will continue to update the products available online, including fantastic special offers, so remember to check back. Currently we do not list all the products we sell online, so if you cannot find the items you require on the site contact us via E-MAIL or phone on 01254 264230. If anyone in the Bamber Bridge area of Preston knows the lad with the XJR1200 who borrowed a 3/4" drive socket bar and socket, can thay please give him a NUDGE - the tools are needed now and we would appreciate their prompt return - Thanks - The Belmont Morris Dancers -p.s. we need to change the wheels on our double decker bus. * Ordering Genuine Parts * Here at Thorncraft we stock thousands of Genuine Spares for all makes of bikes. We have so many products we couldn't put them all online. If you need a part, we can supply it to you at a competitive price. Supply us with your details & requirements via E-MAIL and we will contact you with a price quote, its that simple. If you would prefer to talk to someone call us on 01254 264230. Why not come down and visit us. As we stock thousands of products in store, there is something for everybody, from bike parts to all the 'must have' accessories for road and race. Our friendly staff are always eager to help. Although we don't sell adult bikes, we do have a sales board offering private bike sales in our local area. * Your Comments * As our customers, your satisfaction is our priority. If you have any thoughts or comments about our site, please contact us. All input from yourselves is greatly appreciated.